The provision of affordable housing that is eco-friendly has long been a concern within our community. There is also much interest in co-housing, and in co-operative ownership models. In common with many rural areas of Scotland the Findhorn peninsula suffers from a significant shortage of affordable housing both to buy and to let. In 2004, with the assistance of the Rural Housing Service and Development Trusts Association Scotland we conducted a survey of the local area to evaluate the level of housing need. In 2006 the Ekopia Rules were amended to allow us to become registered as a ‘rural housing body’ with the Scottish Government. Following a generous offer from Duneland Ltd. and the excellent fundraising work of the “Park Housing Co-op Project” various opportunities to support community-owned affordable housing have emerged. These projects also require the formal support of the Moray Council housing department and we are delighted that this has been provided. In the first phase Duneland made available four housing units at the East Whins cluster – 2 x 2-bedroom flats and 2 x 2-bedroom houses at a market value (averaged) of about £175,000 for both rentals and shared ownership. Zero interest loans. Over £100,000 having been secured so far. Grants and donations. We raised over £100,000 for the first 4 units. By arrangement with the Moray Council a “Section 75” agreement worth up to £200,000 was made with Duneland that makes this money available for community-owned housing. A variable amount of the cost was provided by the occupier of the shared ownership houses. Ekopia arranged interest bearing loan finance to cover the balance. This was a huge opportunity for the community. Recent figures provided via the Scottish Governments “Neighbourhood Statistics” website show that the Findhorn peninsula is one of only four places in the Highlands and islands where houses in the cheapest quartile are 11 (eleven) or more times higher than average earnings. This means that without some kind of support system most of our younger members find it all but impossible to get onto the housing ladder. In addition, there is a strong commitment to providing accommodation for older community members in need of palliative care. 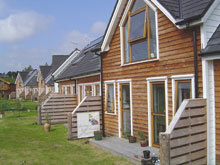 Park Ecovillage Trust is the delivery agent for these affordable homes. Having successfully completed this venture at East Whins, we anticipate using a similar system to support subsequent developments on Duneland and ultimately creating a diversity of community-owned property. There is now another opportunity at the adjacent West Whins cluster and we are actively exploring this. Provide policies so that allocations of housing support can be undertaken in an open, transparent and inclusive manner according to various agreed criteria. The Allocations Policy (pdf) has the details. This sets the criteria for application for housing support awards that applies to all housing support. Each cluster of housing has its own Housing Support Policy, which sits under this allocations policy and covers what type of housing support is available. In 2006, with the generous support of Duneland Ltd. we negotiated the purchase of land at a discounted price that has enabled us to provide housing support to members of the Soillse cluster. In 2007/2008 we received a grant from Co-operative Development Scotland to assist with the creation of a new model for co-operative housing. In 2008 this enabled us to form Station House Co-operative Ltd, along with our associate organisation Ecovillage Partners LLP. This was for the purpose of purchasing the historic Station House, a seven unit property in Findhorn village. The purchase of Station House was completed in November 2008, and the work undertaken has enabled £30,000 to be available to support the provision of low cost rents at this property. We anticipate further projects using variations on this model coming to fruition in the future.